Tactical torches and survival torches have recently surged in popularity due to advancements in handheld torch technology. Functioning as critical survival tools in a wide variety of scenarios such as natural disasters, emergencies, camping situations and as first responder tools, tactical torches are a cut above the average flashlight. The Flash Torch from Wicked Lasers is a breakthrough development in handheld torch technology, offering consumers a torch so powerful it’s able to ignite fires. Offering users an incredible 4100 lumens in a portable, sturdy handheld form factor, the Flash Torch is the most powerful compact searchlights available on the market today. Able to signal to emergency rescue personnel, spot target game in hunting scenarios, provide super bright illumination in any low light situation and even fry an egg, the Flash Torch is the ultimate super powerful tactical flashlight. The first flashlight offering from Wicked Lasers, a company that specializes in super high-intensity laser platforms, the Flash Torch bridges the gap between directed energy weaponry and personal illumination device, creating the ultimate camping aid. What is the Flash Torch? The Flash Torch is no ordinary flashlight. 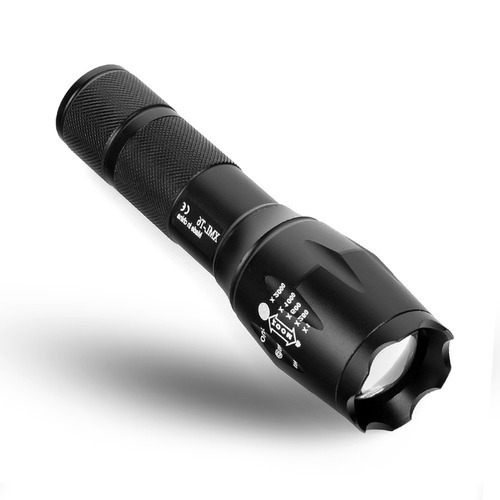 With a finely machined exterior shell constructed entirely from avionics-grade anodized aluminum, the Flash Torch is almost unbreakable, able to function perfectly in any environment imaginable. Protected from sub zero arctic temperatures all the way up to extremely high-temperature situations, the lens array of the Flash Torch incorporates a heat-resistant lens and reflector that directs the super intense power of the Flash Torch emitter into a variety of beam settings. The Flash Torch can be operated as a wide beam illumination device or as a high-intensity spotlight, utilizing a high tech halogen lamp that is guaranteed for over 2000 hours of continuous use, rivaling many commercial LED solutions with many times the brightness. Comparison between normal LED torches and the astounding intensity of the Flash Torch demonstrates the groundbreaking power of this revolutionary flashlight. Normal house LED lights operate at an average brightness of 800 lumens, or about 14 watts of power. The Flash Torch offers an incredible 4100 lumens of power, which equates to over 200 watts of super intense bright light power, almost 15 times more powerful. Does The Flash Torch Battery Last? The battery of the Flash Torch has been specially designed as a unique solution to power the huge draw of the halogen emitter of the Flash Torch, utilizing a lithium ion battery with a bevy of power selection options. Completely rechargeable, the Flash Torch negates the need for continuous battery purchase and replacement, offering significant savings over the long term. If users desire to conserve battery charge for long camping trips or other long engagements, the flash torch can be set to one of three power selection settings that reduce the overall draw on the energy reserve. On the full power setting mode, the Flash Torch is able to ignite fires within an inch of the emitter in just seconds, functioning as a combination lighter and torch. The Flash Torch will instantly incinerate almost any substance in less than a second, from plastics to wood. The intense brightness of the Flash Torch makes it a valuable addition to the everyday carry of any consumer, able to be used as a powerful deterrent in self defense scenarios, blinding would be assailants. The Flash Torch is available from the Wicked Lasers website and is priced at just $199 USD, a low cost investment for a torch that will essentially never need to be replaced or necessitate the purchase of replacement batteries. Covered by a one year comprehensive manufacturer warranty, the Flash Torch is the ultimate personal Tactical Flashlight device.